A group of teenaged Boy Scouts exploring the Washington State wilderness come upon an abandoned shack. The boys, led by Butler (Feldman) discover some heavy-duty weaponry in the shack, namely rocket launchers and bazookas stolen from the U.S. government. Now that the scouts know about the weapons, they come under attack by a team of gun totin’ rednecks led by the emotionless Ritchie (Swayze). But as the movie itself notes at one point, the boys are the small fish, the rednecks are the middle fish, and the big fish is the Shakespeare-quoting Blade (Neame). Now surrounded by baddies on all sides, the scouts end up teaming up with a local girl who shares their cause, Alex (Salenger), and they all use whatever booby trap-making knowledge they have to outwit and defend themselves against the onslaught of people that want their heads. Will they get their merit badge in REVENGE? Find out today! 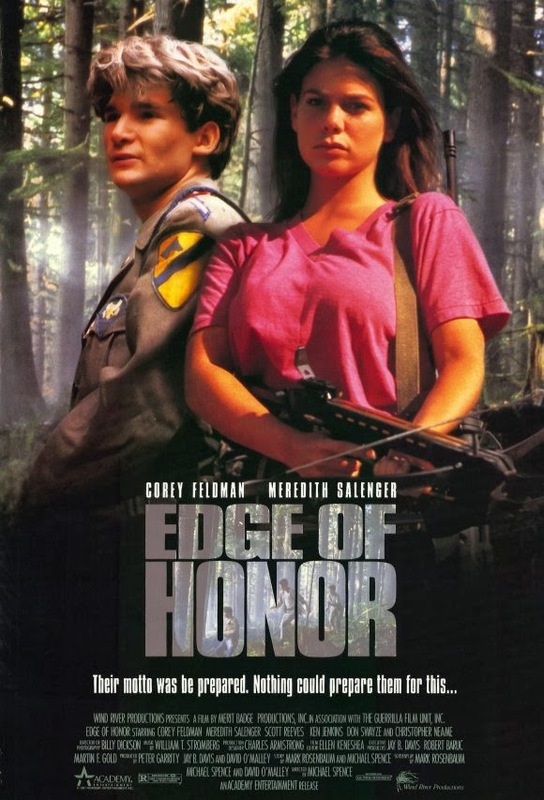 When most people think of Corey Feldman, they don’t often think of Edge of Honor. They probably just assume that he’s off somewhere, doing a Michael Jackson-like dance. That’s a shame and an oversight, because this movie is among his best work. 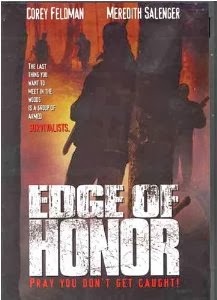 Viewers that get a chance to see Edge of Honor will likely be pleasantly surprised at how engaging and watchable the movie is. We’re not really sure why someone would be surprised, except for the fact that video stores were filled with wilderness slogs at the time like Endangered (1994), and patrons had no reason to believe, at first, that this was any different. But it has a lot of fun, interesting touches that make it worthwhile. And the glasses-wearing Corey gets to do his best Jack Nicholson/Christian Slater/William Devane-like drawl. So you can’t say he does the same thing in every movie. He wouldn’t be this good again until A Dangerous Place (1995). Besides Corey and Don, who are the faces we’re most familiar with, the rest of the cast is very good as well, and we were also familiar with Christopher Neame from his appearances as similar baddies to this one in Diplomatic Immunity (1991) and Irresistible Force (1993) - as well as appearances in Street Knight (1993) and Hellbound (1994). So he pops up more than we realized. 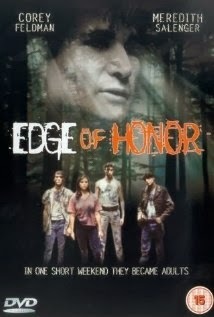 But all told, Edge of Honor is like a DTV counterpart to Red Dawn (1984) - and a pleasant romp in the woods at that. The Academy VHS is worth picking up if you can find it. Excellent review. This is a great little film and a gem worth discovering. A forest, some bazookas and Don Swayze: good stuff. Thanks! Totally agree. A hidden gem...Such a solid movie. For me it is more than solid. I love this movie. Corey's best work. He should've done more movies like this. Another cool "Boy Scout" themed film is Order Of The Eagle with Frank Stallone. On a sidenote, my dad forced me to join the Boy Scouts and I did not like it very much to say the least. Funny you mention Order Of The Eagle, we are posting that Monday! Haha. That's unfortunate you were forced into the boy scouts. We never had to do it...but we forced to go to camp every summer.